Pretty excited to announce that its my Blog Anniversary ! Yes..Thefashionflite turns one ! And I seemed to notice about a week late,but never mind..at least I did ! Thank you immensely for all the encouragement and love you all keep showering in your mails,and making this whole blogging experience a fun activity for me. Initially I was worried- what if I exhaust over all the new ideas,but that's the way blogs are !! At least I could just write about what I feel,my weakness ,my strengths,fashion and what not,thinking there might be someone out there who resonates with the same ideas.. liberating isn't it ? You look very remarkable) Great pictures as well! Lovely outfit! Love the pastel colour combination, perfect for summer! Congrats on turning one! Congratulations on the first anniversary! 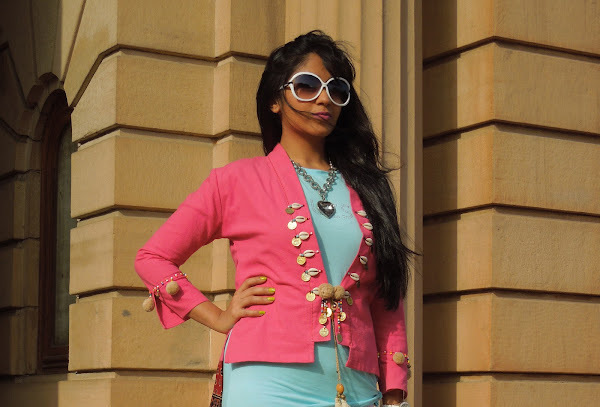 You r going so well Surbhi, wish you a lot more blogging success:-) You look super stylish in pastels..love that jacket!! I love pastel colors! Great look! Very pretty! Love the jacket and the pants! Wishing your blog a very happy anniversary, Surbhi. Hope you touch new heights and explore new horizons with your wonderful blog. Coming to the outfit, I really adore your jacket. It is so quirky and fun. And your glasses are boho-chic too. I really love this pairing. Loving the pastels, pretty lady! Congratulations honey! 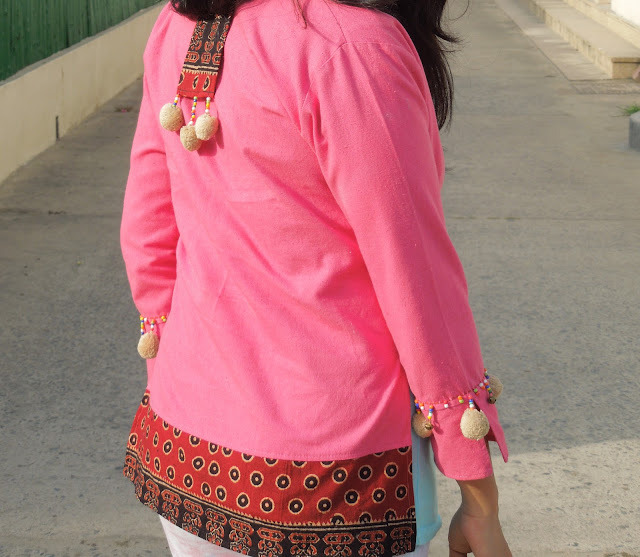 And that jacket is super cute! U look so beautiful..love the jacket. n congrats on ur blog anniversary. u r getting prettier by the day. 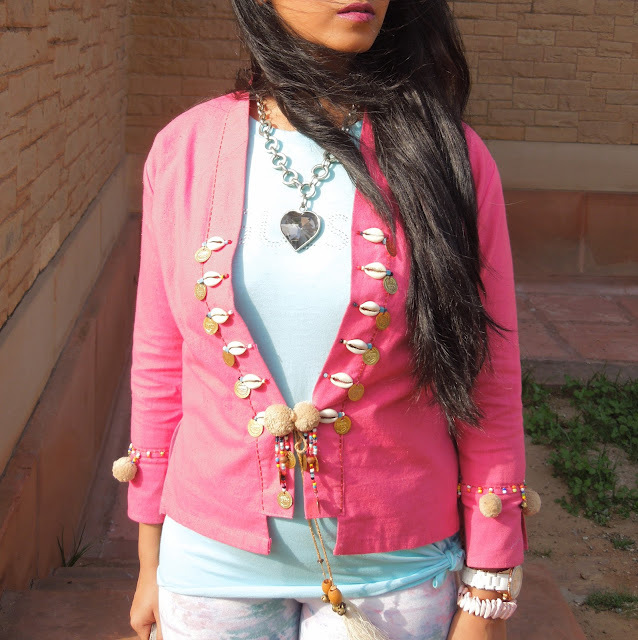 loving this pastel colors mix! Cute outfit! I like the colors you used, so spring. I love all of the pastel, spring really is coming! Gorgeous outfit and Happy anniversary! Love the color mix, and the glasses look so nice! I love your jacket. It's unusual and lovely. I adore this pastel outfit! i love pastels... i need to update my wardrobe. I love the mix of colors and patterns. You look so joyful! Love the printed pants and all the pastels! Officially, it is just seven more days to summer but I really hope it gets warmer soon! Such a beautiful jacket!! You look so pretty in pastels! Hope you are having a wonderful day! HAPPY ANNIVERSARY! never too late to realise :) Keep it goin! Nice outfit, it seems like spring is hear, yeah!! Happy blog anniversary to you! You look amazing, your jacket is just beautiful! I love how unique it is! Carini i leggings (: Reb, xoxo.